This one is destined to become a classic! 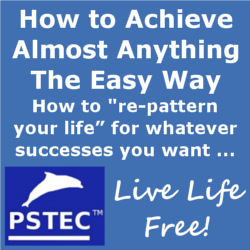 On this audio you’ll discover how to “re-pattern your life” for whatever successes you want the easy way. How you can use PSTEC™ and other simple techniques to turn past failures into future successes. In other words, how to achieve almost anything you want to achieve, and discover how to do it the easy way. Why some people don’t notice opportunities. How to change yourself so opportunities don’t pass you by. The importance of making choices. Can extreme feelings of limitation be removed? The second idea that absolutely kills goal achievement – and how to avoid it. This is ALL tutorial and these are the very same methods and ways of thinking that allowed Tim to achieve worldwide renown in a very short time. You can apply these methods for achievement with anything. Be prepared to listen multiple times.